Hi folks! Today I’m posting something different. I was asked recently by the UK-US Fulbright Commission to speak at a conference for Holyrood Events in Edinburgh entitled International Students: Creating a Home Away from Home. They wanted to hear the perspective of an international student in Scotland on the joys and challenges of studying here and the benefits international students bring to Scotland in addition to their economic value. I wrote the following talk for them and delivered it at the conference this morning (Feb 24, 2016). The conference was fantastic: it was chaired by Henry McLeish, the second First Minister of Scotland, and opened by Humza Yousaf, MSP, who spoke eloquently on the need to bring back the post-study work visa. It was incredibly empowering to hear government and institutional officials discussing immigration in positive terms and advocating easing the restrictions which the U.K. Home Office is currently ramping up. So often as international students I think we can feel isolated and powerless, so it was good to hear that on the issue of immigration, Scotland remains internationalist and that there is universal cross-party consent at Holyrood for facilitating international students’ journeys here and their ability to stay following their studies. My talk is below. I would welcome any comments you have on it, especially from other international students perhaps facing similar challenges. Thanks, as always, for reading! Hello! My name is Katie Ailes and I am what I suppose you could call a career international student; I’ve worked on three separate degrees in Scotland and lived here for about two years when you add up my various study periods. Today I’m going to speak about my experiences as an international student in Scotland, the value that international students bring to the communities we enter, and some of the challenges I perceive as facing international students in the U.K. today. So how did I get here? I’m originally from the US, although I’m told that’s no longer obvious from my accent. In the autumn of 2012, during my junior year of undergraduate study, I embarked on a semester abroad studying literature at Edinburgh University. I was lucky enough to be at an undergraduate institution – Bates College – which highly values international education and supported my travel through advising me on foreign universities, helping to fund my ventures, and facilitating the transition there and back again. 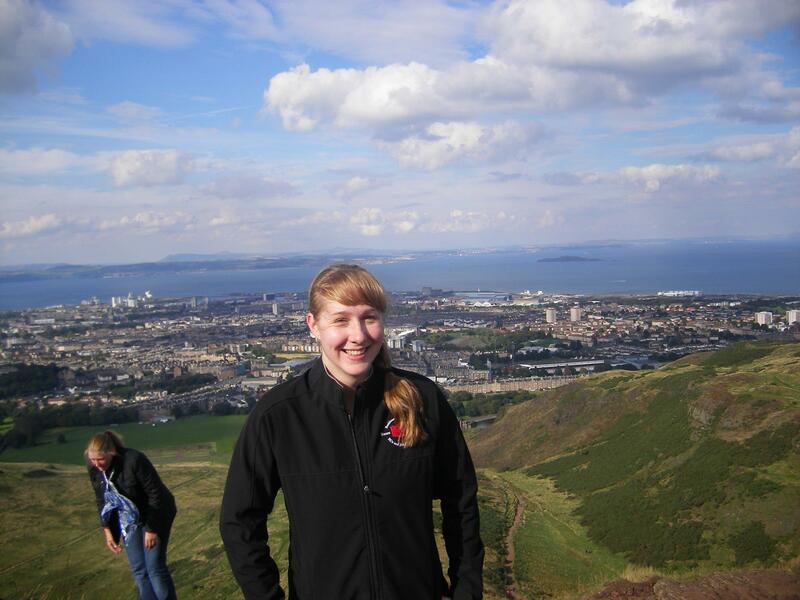 Wee lil me on Arthur’s Seat back in 2012, my first time in Scotland. I’m often asked what attracted me to Scotland, and looking back on my reasoning, I’m slightly embarrassed by its simplicity and naiveté. I needed an English course for my degree, knew the U.K. universities had high quality programs in literature, and quite frankly, liked the idea of a country which has the unicorn as its national animal! I knew virtually nothing of Scotland other than Mel Gibson’s blue face in Braveheart, so I went in blind, guided only by stereotypes. I’d imagine it’s this romantic notion of the nation which draws many international students in: the desire to explore the wild Highlands, to ‘go under the kilt’ of the big cities, to visit a place we’ve experienced only in history books and movies. And course, this romanticism is little more than mythology; but luckily the reality of Scotland proved far better than any Holywood fantasy. I fell in love with Scotland that semester. I loved the warmth of its people, its cities’ sprawling beauty, its wicked sense of humour. On weekends, I travelled all around the country, and on weeknights I stayed up late chatting with my new friends. My flat was a cultural mosaic, composed of students from Belfast, Galway, Inverness, Cumbria, Newcastle, and, of course, the U.S. Without de-valuing the excellent courses I took at the university, I think it’s safe to say that the most poignant learning experiences took place in the living room of that flat, swapping stories with my friends, learning about our differing experiences in education and culture, getting a taste of different ways of life. My first time ever at a slam, in November 2012, at the Edinburgh University Literature Society Slam. While I was abroad, I set myself the challenge to say yes to everything, to embrace the unfamiliar. So when signups opened for a poetry slam, I put my name down and furiously started writing and memorising. I was a shy writer, new to the mic. but at that slam I was warmly welcomed by the diverse artistic community; it was clear the contributions of an international student were valued just as much as those of any veteran of the scene. 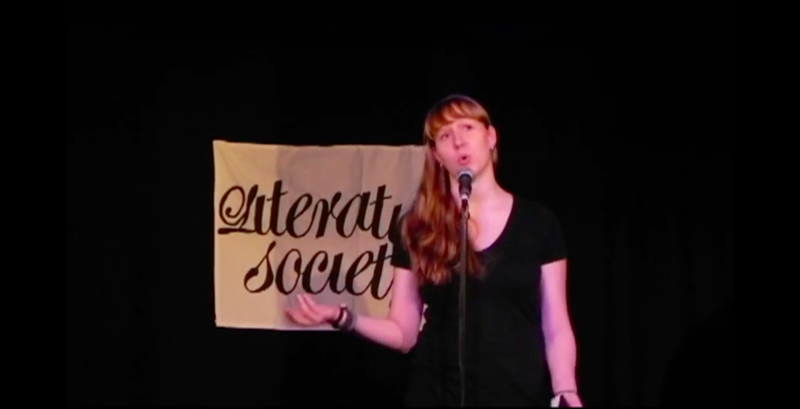 In November 2012 I won my first poetry slam, and the bug had officially been caught – I knew I wanted to return to Scotland to continue my studies and to get better acquainted with this wonderful scene. I flew back to the U.S. to finish my degree, but while there I started work on graduate fellowship applications. Fast forward through hundreds of drafts, many rejections, and far too many cups of coffee, and I received a U.K.-U.S. Fulbright Award to study for my MRes in English at the University of Strathclyde in 2014-15. The US-UK Fulbright cohort for 2014-15 in Stirling for End-Cap. My Fulbright year was brilliant. I was inducted with a large cohort of grantees, driven individuals with fascinating biographies and a desire to immerse ourselves completely in U.K. culture. Throughout the year we were scattered across the U.K., working individually on our degrees but coming together several times to conference about our successes and our experiences (this is us up in Stirling). I’m forever indebted to the Fulbright organisation for making this life-changing experience possible. For my MRes I researched poetry written for the 2014 Scottish independence referendum, focusing on narratives of Scottish history and identity promoted within this work. This research was fascinating to me – I was introduced to Scotland’s politics through the impassioned words of its writers. The research also reinforced in me one of the Fulbright program’s core tenets; that only through genuinely experiencing another culture and communicating with others in it can you truly understand its customs. Before I moved to Scotland I had no understanding of why such a low-population nation would want political independence. It baffled me that the indyref movement had gained such momentum. Once I moved here, though, experienced the energy in George Square on September 18, spoke with campaigners, and read the poetry of citizens advocating both positions, I gained a much deeper appreciation of the issues. My perspective on the independence debate has evolved massively, not just through my research but by living here and having conversations with invested parties. Poetic Politics conference, Sep. 23, 2015. Photo credit: Katie Ailes. This research led to me to exciting academic collaborations. 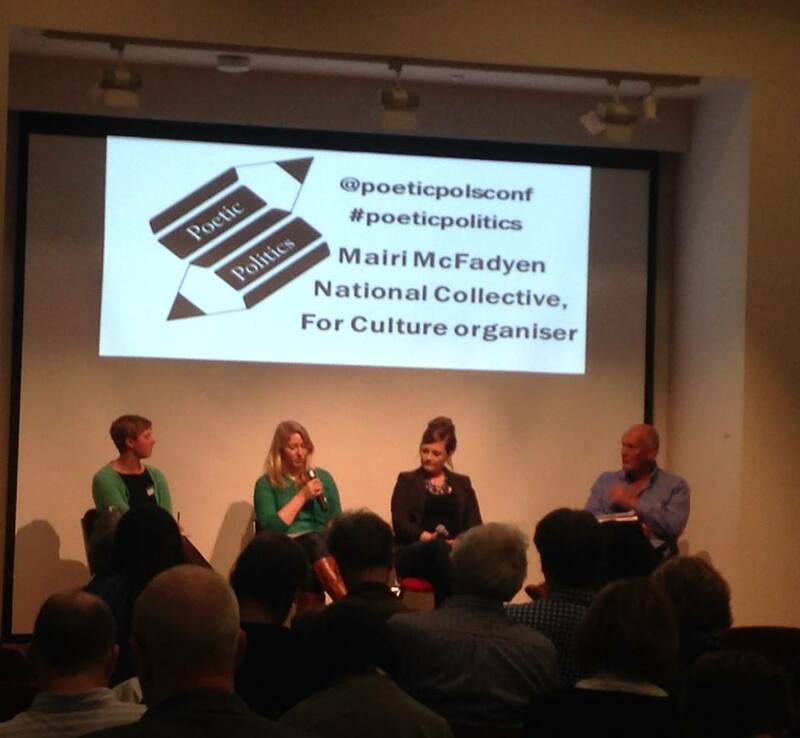 In September 2015 I co-organised and hosted a conference (“Poetic Politics”) at the National Library of Scotland for the one year anniversary of the referendum, focusing on the cultural legacy of that movement. Culture Minister Fiona Hyslop opened the conference, and we heard from speakers including Makar Liz Lochhead, poet and researcher Robert Crawford, and a whole host of other significant figures in contemporary Scottish political and cultural life. My co-organiser for the conference, Sarah Hamlin, is a PhD student from New Zealand, and perhaps half of the speakers were non-Scots; it was very much a cross-cultural endeavor enabled by international students. We are currently working on an anthology of contemporary Scottish political poetry to follow from the conference. But this academic work wasn’t all that I did during my Fulbright year. I’ve again and again found that as an international student in Scotland, some of the richest experiences I’ve had have been outwith the classroom. I also dove deeply back into that artistic community that had thrilled me so much during my first term here: the performance poetry scene. I began performing at open mics again, dusting off old poems, writing new ones, and sharing my work as much as I could. When the Scottish National Slam rolled around in March 2015 I placed second. 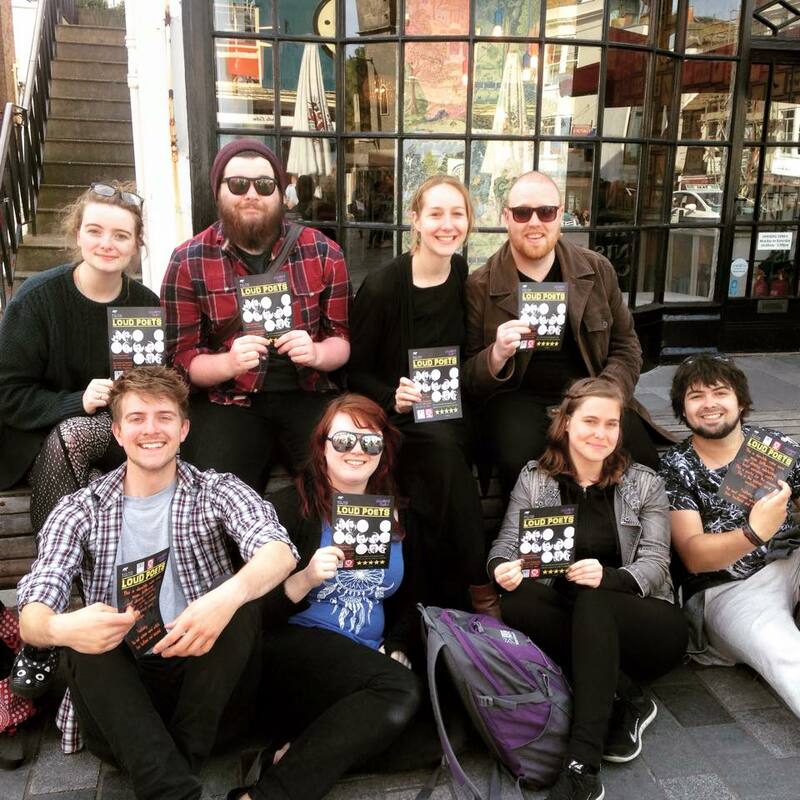 Touring with Loud Poets in Brighton, May 2015. As I got to know more performers and became more familiar with the community, I started wearing other hats as well. I began organising and hosting nights, at first individually but now as a core member of the collective Loud Poets. With Loud Poets, we toured at the Brighton Fringe Festival and put on a five star show at the Edinburgh Fringe, just up the road at the Scottish Storytelling Center. I started blogging about major ideas and issues within the spoken word scene in Scotland [right here!]. I am also the poetry editor for the Strathclyde literary journal, Quotidian, on a panel with several Scottish students and another American PhD. Last year I volunteered at StAnza, the international festival for poetry at St. Andrews, and will again this year – next week. And I serve as an Ambassador for the Scottish Poetry Library, alongside another American postgraduate, Carly Brown. Our supervisor in that role, the SPL Programme Manager Jennifer Williams, is yet another American poet who has made the U.K. her home for over ten years. I’m sharing all of this not to toot my own horn but to demonstrate that international students do not just sit in their rooms and study. In addition to our coursework, we are out there contributing to the cultural, political, and social framework of Scottish life. The longer I’ve been here, the more my relationship with Scotland has evolved. It is no longer this foreign, romantic land of kilts and tartan – it is my home, where my community of friends lives, where my partner lives, where I work and make art, where I buy my groceries and pay my bills. I truly feel like a member of this community, rather than a temporary visitor or a starry-eyed tourist. However, fairly soon after I moved back to Scotland in September 2014, I realized that I couldn’t get too comfortable in that feeling of being settled. My visa expiration date loomed over my head, a constant nag in the back of my mind reminding me that no matter how much I loved it here, I was not a citizen and that my days in the U.K. were numbered. Even as I was beginning my MRes research, I also needed to simultaneously begin planning for the next phase of my life: what research or job would I do? Would it sponsor a visa? How could I remain within these communities which had welcomed me so wholeheartedly, and which I had become deeply invested in? How could I further my career? I felt myself wanting to root my life in Scotland in terms of my academic career, my artistic endeavours, and my personal relationships, but was wary: conscious that if I failed to obtain another visa, this life could be swept from under my feet. That poem I just performed, ‘Outwith’ – several months ago I performed it at a Glasgow open mic, Inn Deep, and a Scottish student approached me afterwards, in tears. Her two best friends, international students from Australia, had just had to leave Scotland because their visas had expired before they could find jobs earning above the specified income threshold for immigrants in the four month “grace period” following the end of their studies. They had also felt “with” Scotland, but were unable to pull off the logistical acrobatics required to stay. Their experiences are not unique – I have heard so many horror stories of non-E.U. international students who desperately want to stay here, to settle and give back to the country they have come to love, but cannot find a job with the ability to sponsor a visa in the scant four months allotted to them and thus are forced to leave their friends, partners, and communities. I cannot speak to the experiences of those in more immediately lucrative fields – it is possible that finding a job earning above the income threshold is easy for students in engineering, finance, or medicine. However, as someone who was considering positions in arts administration, journalism, teaching, and the creative industries, I knew at the start of my MRes that finding an entry-level position in Scotland paying above the threshold would be impossible. That limitation factored into my decision to apply for a scholarship to continue my academic work through a doctoral program. However, that also proved a difficult search; the majority of postgraduate scholarship opportunities in the U.K. in the arts and humanities, such as those offered through the AHRC, are limited to E.U. citizens, leaving scarce opportunities for non-E.U. students. Luckily, Strathclyde offers a Studentship through its Humanities and Social Sciences postgraduate department. With the support of my department, and yet again far too many cups of coffee, I applied for it. To my unending joy and relief, I won one of the two Studentships offered for this academic cycle. This past autumn I began pursuing my PhD at Strathclyde researching contemporary performance poetry in the U.K. context; essentially I research as a scholar what I practice as an artist, and it’s been fantastic. However, my joy at receiving this award and being able to continue my studies was tempered by my knowledge of how many international students in my position were not so lucky – the application pool was enormous, and many international students who had applied were now in the position of needing to return to their home countries to figure out their next steps. I have always, always felt wholeheartedly welcomed by Scotland’s people. I have never been treated as an outsider, never perceived as a foreigner to be shunned. Unfortunately, I cannot say the same of the way I feel the current U.K. government seems to treat its international students. The recent policies emerging from the Home Office – scrapping the post-study visa, limiting the abilities of international students to work, raising the pre-existing monetary requirements – make me feel less like a valued member of an intellectual community and more like a cash cow, whisked in with my foreign dollars only to be booted out the door once my tuition payments stop flowing. Several recent cases in the news have reinforced this feeling, most horrifyingly the case of Dr. Paul Hamilton. This recent PhD graduate at the University of Birmingham was arrested and put into police detention for over a week without any prior warning that his application to remain in the U.K. had been rejected almost two months earlier. Perhaps the worst element of Dr. Hamilton’s case is the Home Office’s rationale for arresting him on the assumption that he didn’t “not have enough close ties (eg. family or friends) to make it likely that [he] will stay in one place.” This statement reflects the Home Offices’ incorrect assumption that international students do not create ties to their local communities and that their communities have no investment in them staying – an assumption firmly refuted by the fact that Dr. Hamilton’s U.K. friends raised over £8,000 to cover his legal fees. With these issues in mind, I’d like to turn to a discussion of some of the benefits international students bring to Scotland, not only during their period of study but also after. It is easy to speak of the economic benefits international students bring to Scotland: we pay very high tuition fees, we contribute to the local economy through paying rent, bills, and living expenses, our families bring in even more foreign dollars by coming to visit us while we’re abroad. It is equally easy to speak of the financial value of retaining international students in Scotland following their studies – the benefits of retaining those freshly acquired skill sets within U.K. borders, of students graduating and beginning to pay council tax, etc. We bring wealth to the local economy prior to, during, and following our studies; this I consider to be obvious. What is much more interesting, and what tends to get looked over in the immigration debate, are the cultural benefits. There are the artistic crossovers where artists carry their work to new places, where that style evolves and takes on local flavours. Spoken word poetry, born in the U.S. but currently booming in the U.K., is a child of such global transmission and evolution. There are the linguistic fusions where dialects and slangs collide, birthing new forms of speech. And of course there are the culinary effects: one need look no further than the local curry joint or pizzeria for mouthwatering evidence of those. But there’s another cultural benefit which is almost never discussed, and that’s what I want to focus on here. Relaxing immigration policies is always discussed as antithetical to national security interests. More and more nowadays, politicians herald the dangers of opening our borders, flame fears of terrorist invasion, speak of safety in walls and heightened security (just listen to any of Donald Trump’s speeches for an example). The Home Office’s crackdown on international students is part of their wider agenda to tighten immigration, seemingly due to these security fears. However, I see the solution in opposite terms. I argue that by tightening restrictions on the ability of students to travel and study internationally, we are missing out on a major opportunity for positive cultural diplomacy through citizen exposure to diversity, cross-cultural understanding, and plain old dialogue between people of different backgrounds. In today’s world rife with misunderstandings, violence, and hatred, we need this dialogue more than ever. We need to constantly be exposed to people who don’t look like us, don’t talk like us, don’t think like us – and not just over the Internet or through the television – in the streets, in the classrooms, in the pubs. It is the responsibility of a government, I believe, not only to protect and defend its people from war and violence, but also from the insularity, fear, and prejudice that can occur when we only ever communicate with people who behave just like we do; when figurative and literal walls separate us from others. While any international travel helps to erode that insularity, international students are specially poised to break down stereotypes and fears. We enter new contexts eager to learn, ready to meet new friends and explore new places. We absorb the new culture and contribute to it. Through team projects in our courses, we collaborate with other local and international students, creating diverse microcosms proving the potential of international collaboration and growth. I don’t think the burden of progress here lies with the individual academic institutions. I have found the individual universities and visa support officers to all be very supportive of international students – after all, we’re a financial boon to them. Strathclyde has been great with helping me through visa applications and demystifying all of the small print. One way in which institutions and networks of institutions can assist, though, is through providing more scholarship opportunities for postgraduate research which are accessible to non-EU post-graduate students. I was also encouraged when I saw the talk planned for later today on creating opportunities for U.K. and international students to mingle: these kinds of initiatives help to more easily create these cross-cultural ties and to integrate international students into the cultural fabric of the U.K., and thus should be encouraged. For the most part, though, the changes needs to occur on a policy level. I would advocate for the return of the post-study visa, enabling international students to work in the U.K. following their studies for an extended period in jobs without restrictively high income thresholds. I would also advocate for the reduction of visa application fees, which currently make the price of the application prohibitively high, particularly when considered in combination with the new Immigrant Health Surcharge fee and the upfront costs of international flights, tuition payments, and rent. Perhaps most importantly, though, is curtailing this xenophobic culture which is beginning to fester in too many hearts and minds. Isolationism may seem to be a logical reaction to the fear of foreign threats; however, cutting ourselves off only breeds further insularity and prejudice. In these times dominated by fear, what we need more than ever is to make the unknown familiar through opening our borders, our hearts, and our minds, to those who look, think, and live differently to us; to engage in dialogue with others. Reversing recent restrictions on international students’ abilities to study here is an easy step towards rolling back this tide of fear and replacing it with genuine opportunities for reconciliation. I feel incredibly blessed to have had the opportunities living in Scotland has provided, from my academic career here to my artistic pursuits to my community of colleagues and friends. I couldn’t be happier I made the leap to study here back in 2012. My only hope is that more students with the initiative to study beyond their borders can be supported in their efforts to do so and welcomed as I was not only by the people of Scotland, but also by its institutions and government. Thank you very much for listening. This truly is a great post! Would you mind if we shared it with our students at http://www.schoolinks.com/talk ? Let me know! Hello – you are more than welcome to place a link to this website on your site; however, I would prefer that you not copy and paste the post onto your site. Thank you!